China should break up the state monopolies which dominate nearly half of its economy to create a level playing field for both foreign firms and private Chinese companies, Craig Allen, President of the U.S.-China Business Council said. The power of monopolies in China is “very unnatural and abnormal” compared with other countries, Allen said in an interview with the South China Morning Post, adding that 43% to 45% of China’s economy is closed to foreign investment and Chinese privately-owned companies. The long list of sectors controlled by state-owned enterprises in China includes telecom, media, electric power, oil and gas, coal, steel, aluminum, construction, engineering, aviation, railways, and most of the insurance and banking sector, he said. The present economic model “served China well” when it was trying to catch up to developed countries after opening up to the West 40 years ago, Allen said. But “the catch-up is over”, and China, now the world’s second-largest economy, should get prepared for the next step in its development, which “is about innovation, creativity, intellectual property and globalization on equal terms”, the U.S.-China Business Council President said. The state-controlled economic style is “very much outside of the parameters of the World Trade Organization” and out of line with the expectation that China would integrate its economy with the global economy when it joined the WTO in 2001, Allen said. “We are hopeful that the trade negotiations will lead to a positive reformulation of economic structure in China”. Foreign companies, he said, want “real competition and a real opportunity to compete. We are not asking for a guaranteed outcome. We are asking for guaranteed access. There are some difficult problems. It is more important to do it well than do it quickly, but we are hopeful that there will be a resolution soon,” he said. “By allowing foreign companies to come in, you will have lower prices, better services and more competition,” he said. “That is exactly what China needs to escape the middle income trap. That is exactly the medicine you need to add economic growth. Foreign companies can add dynamism and competitive juice and global best practices, helping to minimize corruption,” Allen said. All of the business council’s member companies have been affected by the trade war, Allen added. 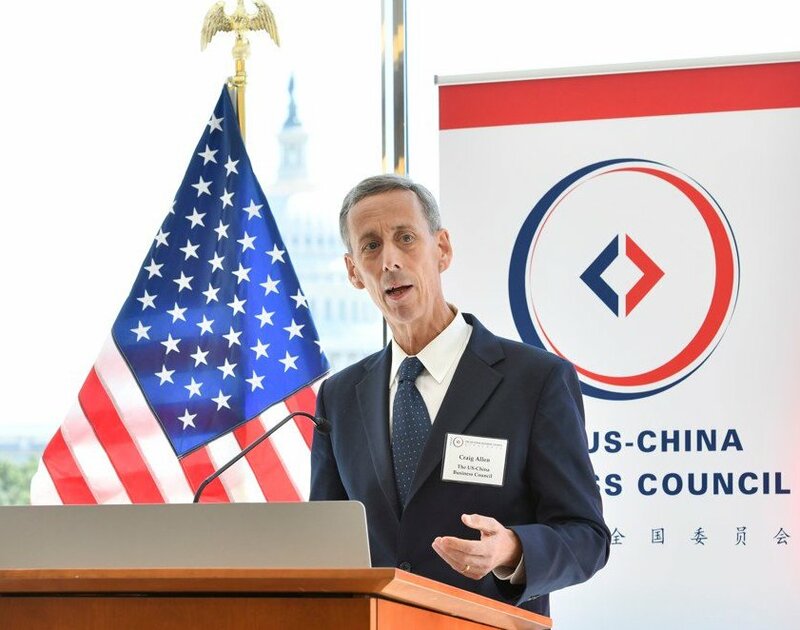 Allen, a former trade official who held posts in the administrations of several U.S. Presidents – including as senior commercial officer in Beijing – was appointed Council President in July 2018. The Council has about 200 member U.S. companies that do business with China, including Amazon, Coca-Cola, Boeing, Cisco, Dell, and Walt Disney. It was founded in 1973, a year after former U.S. President Richard Nixon’s trip to China helped push the country out of its long diplomatic isolation and towards its opening up to the West, the South China Morning Post reports.